I don’t really feel like writing about another terrorist attack, or the stupidity of Democrats. In America, especially among the shooting sports, we have a means of dealing with both and that insanity is completely avoidable. I’m talking about the Cowboy Way which is an evolved philosophy of conduct born from the notion of individual freedom and property rights defense—and its very unique to the world. By day, I get the opportunity professionally to deal with a variety of international cultures and through my love of mythology I have a means of gaining more understanding than the typical person visiting an airport in Tokyo might experience. For a good culture to survive or even thrive, you have to know what you are—and in America at the heart of our fundamental philosophy is the Cowboy Way. To be a part of it, or to understand it in some fundamental way, becoming involved in a shooting sport of some kind will usually evoke the basic elements. That is why for the last two years I have been learning a new skill—Cowboy Fast Draw. Well, it has taken a little time and a lot of investment but I’m getting ready to do a little competition shooting so I was taking some video of my form to slow down and analyze, and I thought I’d share that video so that my readers can have an understanding of something I think is important. I’ve set up a target range for Cowboy Fast Draw in my garage and it’s where I go to dump away stress and to fine tune a mild obsession for me in the realm of speed and accuracy. How fast can a person really shoot and hit a target in the micro seconds of judgment? Before I elaborate, here is a bit of my practice session from Friday evening this past week. I like the results, but in all honesty, I’m pushing to be twice as fast as what is seen in this video. These shots are in the .450 to .470 range—which is pretty good. But not where I want to be. However, what matters most is the experience of developing the Cowboy Way through this art and that is truly something very special. Working with the western arts for over 25 years as a bull whip artist I often ran into these quick draw guys and I always enjoyed watching them. But time and the initial investment to get started were certainly barriers of entry. There are a number of different fast draw organizations out there and most of them were pretty loose and hadn’t really done anything to advance the sport in a way that was respectable. That is until I learned more specifically about the CFDA, (Cowboy Fast Draw Association). They had their act together and from what I could tell was doing great things in advancing the concept of the Cowboy Way. Around this time of getting started in Cowboy Fast Draw I was involved in two international cultures professionally, one in Japan where the samurai is still very important to their business climate. And the other was in Europe where the virtues of the Crusades and King Author’s adventures as a knight of the Round Table are the soil that all their roots emerge from. I couldn’t help but think that for America to really mature into its own thing—which is essentially where we are—we needed to embrace our own philosophic—warrior past and roll it into our business culture. In a tremendous way, Hollywood had already done that and our society flourished enormously during the 1930s to the 1960s when movie and television westerns were most of what Hollywood put out. A lot of the movies made in this period I was surprised to learn were shown on television in Europe and Japan as they were fascinated with the idea of the American cowboy and the values which poured forth from it. Recently while staying in England for an extended period I counted at least five television channels that were showing American westerns during a Saturday afternoon—and they were old westerns. Nothing produced within the last five decades. Additionally I was coming under a lot of criticism for my very reckless ways of doing things—or what appeared to slow minded people as reckless. I often get accused for “shooting from the hip” as if that were some kind of bad thing by rivals. This is in reference to my tendency to make decisions on my own—without a lot of group involvement, and to make those decisions quickly. I don’t sleep on much but instead usually draw and fire at that moment. To me it doesn’t seem so fast, but that’s because I’m already thinking in a very fast way so what might seem like forever to me is very fast to the people watching from the outside. So I got involved in Cowboy Fast Draw for other reasons too, and that was to prove that you could draw and fire from the hip quickly and accurately and that it wasn’t so reckless—but rather quite precise. The safe thing for me would be to not get involved in this type of thing. After all, I had been one of the best bull whip artists in the world and I had often used my experience with that endeavor to explain many complicated business concepts—such as putting out the flame on a candle with the crack of a whip like I did for the SB5 Bill before Governor Kasich went to the dark side and was still trying to do good work in Ohio, to demonstrate how to cut fat out of the budget with precision. To hit a specific target with the tip of a bull whip is difficult and not many people in the world can do it—but I can and I could use that calling card forever and nobody would blame me. Taking up Cowboy Fast Draw and joining a sport that already has so many lightening fast people competing in it doesn’t make much sense to most because it’s harder to be unique in such a field, if that is what you are going for in life. Yet for me it’s about the things that happen in a fraction of a second that sends my mind ablaze with wonder, and obsession. I hit a major milestone with some of my professional work a few years back and came into some expendable cash so that’s when I bought my fast draw rig and my new Ruger Vaquero. 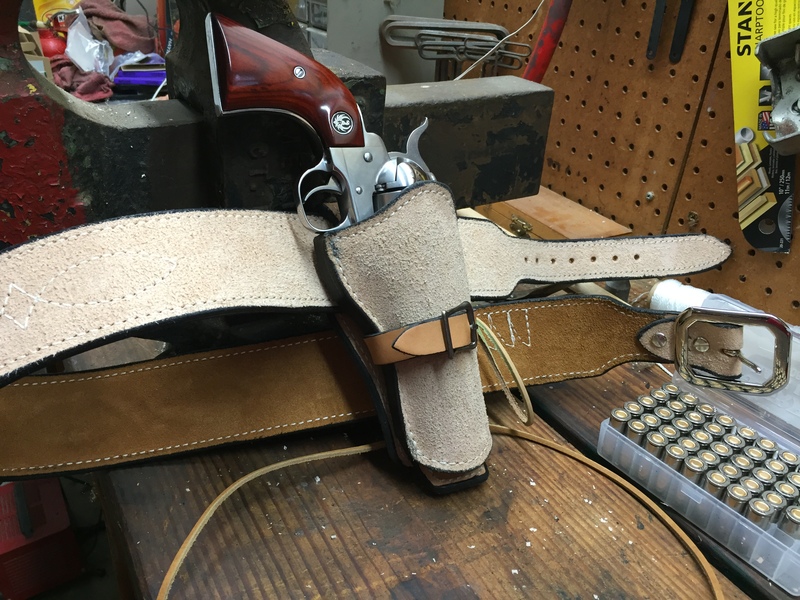 The very first thing I did, because I had been thinking of it for over twenty years, was find a fast draw organization that I could join up with and master the art. That’s when I noticed that the Cowboy Fast Draw Association really had everything figured out—the targeting system you could buy from them and it came all ready to set up and use and the ammunition was easy to get. The wax bullets I get for a good price from CFDA and the shotgun primers I get at Cabela’s about every few weeks in boxes of 1000. To get good at something like Cowboy Fast Draw you have to practice a lot and to do that you have to get the economics lined up correctly. The way they have things set up in the Cowboy Fast Draw Association it costs about .06 per shot. To get to where you see me in the video above I have fired about 10,000 rounds at the target shown which is about $600 of investment in ammunition which might sound like a lot, but for shooting it really isn’t. It’s almost as cheap as BB gun shooting, but Cowboy Fast Draw is much better. By the time I get to my next 10,000 shots, I will likely get my times down by .100 of a second. Perhaps by the next 50,000 shots, I may even do better than that. If you watch the video in slow motion taken from many angles, the areas for improvement are the time reacting to the light and the time from drawing the gun and actually pulling the trigger. We are all taught that the way to shoot is to aim with the targeting bead carefully so the tendency to get the gun out in front of you is very instinctual. But to get the fast times you really need to fire right out of the holster. 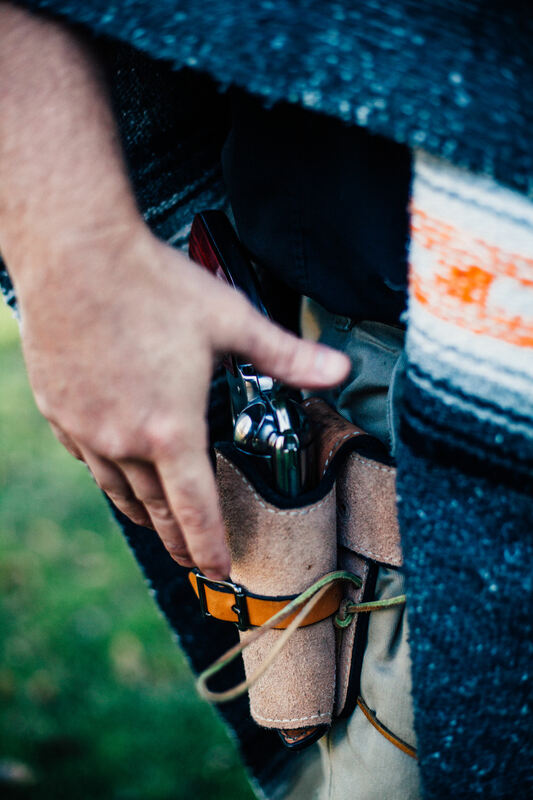 When I bought that holster I commissioned it from Bob Mernickle who makes holsters specifically to the stringent rules of the Cowboy Fast Draw Association just to be safe, and I have to say that it is my favorite thing in the world. When I come home from a hard day, nothing feels better than putting on my fast draw rig and practicing a little fast draw. There really isn’t anything better in the world than the smell of gun smoke, Hoppes gun cleaner, and finely worked leather to the sounds of talk radio giving you the news of the day. I’ve had a very good life and I have owned many things that made me very happy, but my fast draw rig and the Ruger Vaquero that rest in it is the best thing I’ve ever owned. There is great symbolic meaning which is very important to me patriotically as well as philosophically that come with them. Until I shot that video the other day I wasn’t sure how I was doing. I didn’t worry about the form or how it looked; I just practiced with an eye on being able to compete within a few years. I talked about it here when I started and I have been having fun with it. I was pretty happy with the video I saw. Everything happens so fast that it’s difficult to tell what is going on until you slow things down for analysis. But so far so good, and I share it just in case some of my readers out there want to use it as an entry point into the sport for themselves. It’s an all American past time and just the function of it is important to the philosophic development of the Cowboy Way which is something everyone would do well to learn—especially young people. Other cultures—especially the Japanese, certainly are proud of their artistic warrior arts which put their societies on the map of relevancy. In America, gunfighting is a martial art of our own invention and I think it’s time we embrace it—formally, not just in old movies. Cowboy Fast Draw is a great way to do that. You can practice at your own home relatively cheaply and it really gets you close to the spirit of America. For me, it’s that quest to show how accurate a person can be shooting from the hip. As those who have been so critical of my way of thinking about most all things, the proof that it’s possible is obvious. But I’m not done yet.